When it comes to fashion, Great Britain has always been one to honour their longstanding traditions, much like the many historical monuments amidst their country. Notable labels such as Burberry, Gieves & Hawkes, Hackett London, Paul Smith and many more, have been around for generations, dressing up Britain the way we have come to know through portrayals in books, televisions and films. While these enduring fashion brands are still ever renowned on British soil, as they collaborate with the technology of today to further sustain their brands, newer fashion enterprises are popping up, in hopes to offer British fashion in a renewed light that may take the country’s industry to greater and better heights. We take a closer look at the newer generations in British fashion, which includes an archival goldmine of their budding local fashion designers, a knitwear democracy, and an evolution in shopping. Plus, how their individual endeavours are changing the course of consumerism and the fashion industry as a whole. Already dubbed as one of Selfridges’ Bright Young Things for 2016, Unmade is a vertically integrated fashion start-up based in London, founded in 2013 by London’s Royal College of Art schoolmates, Ben Alun-Jones, Kirsty Emery and Hall Watts. Their mission: to assist designers in creating sustainable, profitable, innovative knitwear, while building collaborative relationships across the industry. Specialising in knitwear like sweaters and scarves, Unmade is a knitting programme made easy for each individual knit wearer out there, allowing designers to customise their own clothing according to different specifications, and then producing them on-demand for each shopper. Think numbered landscape painting, but for your knitwear. If you’ve never picked up a yarn ball or done needle stitching person ever in your life, and God forbid you have the time to grab a copy of Knitting for Dummies, Unmade has created style guides that can be edited to your liking, with a carefully guided editing process, in which customers can easily create garments within set style parameters. This includes, customising your own prints, resizing the patterns, and choosing your own colours. Not to mention, Unmade uses high quality, extra fine merino wool and Italian-spun cashmere, so you can rest easy knowing that your knitwear will not run out of shape after a couple of washes. When it comes to production cost, orders made online via Unmade will not go straight into production immediately, as their system collects only digital stocks. Orders are rendered photo-realistically on models on screen, giving you a final and assuring view of your creation before you make your payment. Only then will production start, before proceeding to an under-48-hours delivery. From a business and environmental point of view, you could say that Unmade has single-handedly reduce, on a radical scale, the risk of unsold inventory, while avoiding cash flow issues usually faced by independent and new fashion designers. Translation: your very own cost efficient knitwear, made within the size of mass production. Good news for budding fashion designers, no? At the rate this form of novelty is going, before we know it, we wouldn’t need the mass produced fast fashion market anymore. We could be our own supply and demand system, reclaiming the character within our clothing, and creating considered pieces with a perennial place in everyone’s wardrobe. And what a brave new world that would be! Imagine flipping through a magazine, (like the one that you’re reading right now, perhaps), and upon seeing something you like, you can immediately purchase it through its pages; maybe even get transported to a physical store somewhere in the world if you stare at the photos hard enough. We hope you did not just do what we just said, (it would be quite funny if you did, and we wish we were there to see it), because our magazine does not hold such auxiliary technology to an augmented reality… yet. But rest assured that this kind of technological modernisation is already happening somewhere else in the world, if it’s but just the other way round: a store that acts like a life-size magazine, where you can read about your favourite fashion products, and if you fancy, purchase them on the spot. 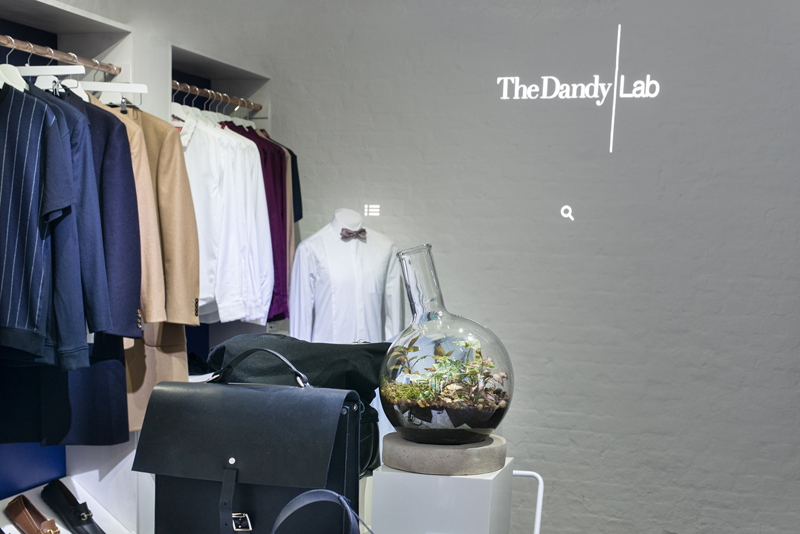 Launched in August to acclaimed and overwhelming reviews, The Dandy Lab blends the best of both worlds by giving customers the tactility of high street, with the choice of online shopping. 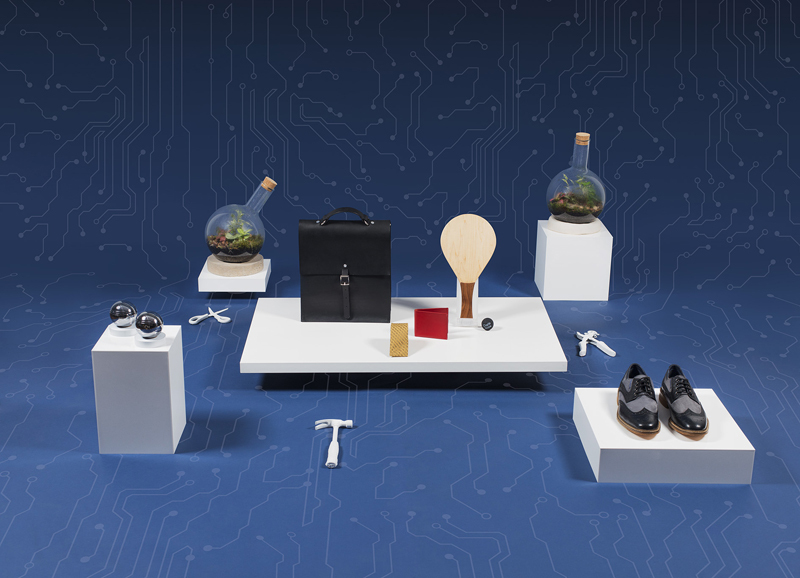 This new lifestyle concept store, enhanced by technology, is known as UK’s men’s retailing emporium that fuses fashion, lifestyle and technology – all under one roof. Spearheaded by co-founders Julija Bainiaksina and Peter Jeun Ho Tsang, the physical store, located at Old Spitalfields Market, along Brushfield Street in London, features everything a man needs to discover, learn, shop and share, fashion and lifestyle like never before. The “digical” experience features amenities, such as smart mannequins, shoppable mirrors, a virtual showroom, an interactive styling wall, and a café with wireless charging points. 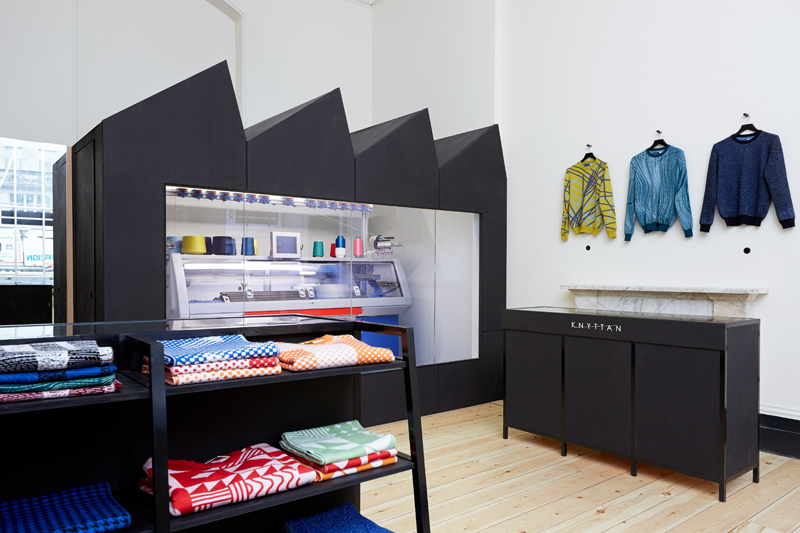 A walk through the two-storey store will allow customers to access “stories” via a number of display screens, on the specially curated selection of contemporary and exclusive British brands and manufactured gentlemen’s goods. Catered particularly to fashion aficionados who like quality products, value British design, and most importantly, a different experience when they shop, already available in The Dandy Lab are fashion brands like Smyth and Gibson, Leo Joseph and Alfie Douglas, grooming products such as The Gentle-Man and Carter & Bond, as well as lifestyle accessories from London Terrariums and Sloane Stationery. Besides that, the lower floor also houses an exhibition and event space, where regular brand and product launches, as well as workshops, forums, lectures and technology briefings, take place. As the saying goes: United we stand, divided we fall. With that, the husband and wife duo behind the aptly named online portal has assembled budding fashion designers from around the country, and given them a platform to show the world what their creativity is capable of. Whilst the UK has always been on the forefront when it comes to helping homegrown talents reach their full potentials – such as dedicated fashion schools and organisations like the British Fashion Council, and the many independent brands (Mary Katranzou, Christopher Kane and Nicholas Kirkwood, to name a few) that have achieved international acclaims in their own time – much assistance is still needed when it comes to helping brands operating on a shoestring budget. 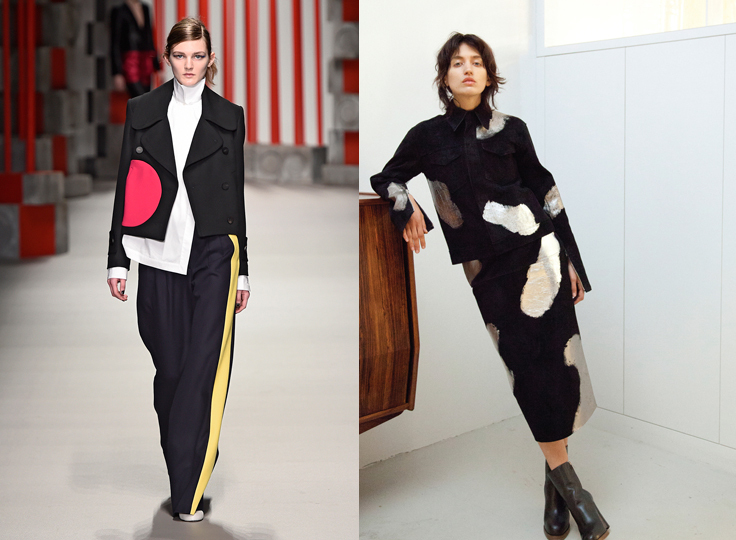 Hence, here is where Young British Designers (YBD) steps in. Simple enough, YBD latches on to the grand ol’ idea of the World Wide Web, and what the technological invention can do in spreading information around the world. They have created an interactive platform for up and coming fashion labels to exhibit their latest collection, and if need be, even invest in the talents themselves to help them get off the ground. YBD also buys the collections from the designers; no sale or return, or even charging for web space! Fashion labels such as Sophie Hulme, JW Anderson, Eudon Choi, Georgia Hardinge and Rejina Pyo were some of the first few labels to have experienced YBD’s generosity since its establishment back in 2010. Besides that, YBD is also the go-to website if one were curious enough to explore what the great country of Britain has to offer. Paired with interesting editorial content chock full with styling ideas from top bloggers for the She Wears It Well section in the website, and the Dressing Up Box function, visitors get to try on new seasonal pieces from the comfort of their own homes. Currently, YBD has some 50 British designers already showcasing their latest and best on their website: Charlie May, Danielle Romeril, Jam Love London, Lily Kamper, Ziiga – the list just goes on and on! As long as there is a fashion week going on, be it in London or in Paris, a fashion graduate school out there pruning the next generation of fashion designers, or even social media channels raising red flags on what will be trending in the next five years, YBD will be there, ready to get in on a piece of the action! This featured article was published in the HANGER AW15 issue.